Doing articles like this one always makes me hungry…. Today I found out that the inventor of the Pringles can was buried in one (part of him, anyway). Upon his death in 2008, just 20 days shy of his 90th birthday, the inventor of the Pringles can, Fredric J. Baur, was cremated. In keeping with his wishes, his family placed some of his ashes in a Pringles can (not all of the ashes fit). This can was then buried with most of the rest of his remains placed in a traditional urn. A second urn also contained a small portion of his remains which were given to one of Baur’s grandchildren, rather than buried. Dr. Fredric Baur was also the one that originally came up with the “saddle” shape (hyperbolic paraboloid) of the fried dough that is Pringles (note: not baked, as many seem to think). While employed by Proctor & Gamble as chemist, he was assigned the task of finding a way to get around the problem of stale and broken chips in bags and thus worked on finding an alternative “chip” and container. He was not the one to ultimately bring Pringles out as a commercial product. The “chip” he came up with just didn’t taste very good and he was eventually assigned a different task. 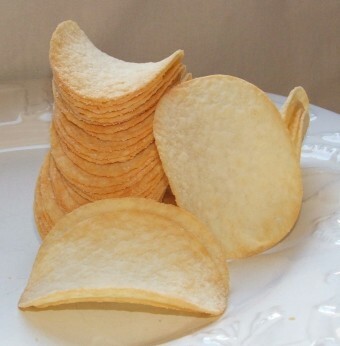 They were originally called “Pringles Newfangled Potato Chips”. However, Pringles contain only about 42% potato based content, with most of the rest being from wheat starch and various types of flour, including from corn and rice. Thus, the U.S. Food and Drug Administration made them change the name because their product didn’t technically meet the definition of a potato chip. Thus, they were only allowed to use the word “chip” in very restrictive ways. Specifically, if they wanted to continue to use “chip”, they were only allowed to say “Pringles Potato Chips Made From Dried Potatoes”. Not being too fond of this requirement, the company changed the name slightly, using “potato crisps”, rather than “potato chips”. Today, of course, most people just know them as “Pringles”. While Proctor & Gamble initially argued that Pringles were in fact “chips” in the U.S., they took a different tact in the U.K. In order to avoid a 17.5% Value Added Tax (VAT) in the U.K., Proctor & Gamble stated that Pringles should be considered a cake, rather than a “crisp”. Their argument was that since only 42% of the product was made from potato and the fact that it is fashioned from dough, that it should be considered a cake and not be subject to the tax put on chips. After all, that’s why the U.S. Food and Drug Administration had previously made them change from being a chip to a “crisp”. The company initially won in High Court and were briefly considered a cake in the U.K. However, Her Majesty’s Revenue & Customs appealed the decision and, in 2009, the ruling was reversed and the company had to start paying the VAT. A man named Alan who died in 2009 was given, what may be called, the geekiest last resting place to date. His brother gutted his computer case (a 1990s era SPARCstation), and placed his remains inside. Loved ones were then encouraged to leave a post-it note messages on the case. His brother then lovingly inscribed the case with the words “Beam me up Scotty, I’m done here”. Just when you think fighting the VAT is fruitless, in 2009, Marks & Spencer won a 13 year battle with the government on whether it should have paid 3.5 million pounds of VAT. Their chocolate covered teacakes were wrongly classified as biscuits, and as such were subject to the tax. When it was found that they should have been classified as cakes instead, the company sued for back taxes and won the decision.